To keep things simple and to maximize value to our customers, we offer FREE SHIPPING on orders over $99. Since we ship our products from a variety of designers and suppliers and many are made-to-order, shipping time varies depending on the product or products you've ordered. Most orders ship within 2-5 business days after we receive your order depending on availability. If an item you've ordered is out of stock or discontinued, we will make every effort to contact you as soon as possible (please be sure your contact information is correct!). Please note that information on usual ship times is included on many of our product information pages, especially for made-to-order products such as Susan Lanci Designs & Bowers Beds. Once an items is shipped, we can not refund shipping fees unless we made an error or the item was defective. Most shipments are sent USPS or UPS, but other carriers including FedEx may also be used at the discretion of our suppliers. After your order is confirmed, you can track your shipment through most shipping carriers by logging into your PetsLoveToShop.com account. If you've ordered several different products, you may receive your order in more than one shipment from more than one location. 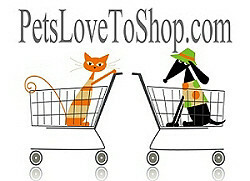 PetsLoveToShop.com cannot be responsible for shipments to addresses that were given to us incorrectly, or for refused or unclaimed shipments. We also cannot be held liable for any package(s), which are lost, stolen or delayed in transit or after delivery at your address. In the event your package(s) is lost, stolen or delayed, we will assist you any way possible. However, package(s) showing delivery confirmed by our carrier's tracking system cannot be refunded if stolen or lost at your delivery address. Currently we ship within the continental US & Canada. We will be adding global shipping capability very soon. You may return most new, unopened items within 30 days of delivery. We'll also pay the return shipping costs if the return is a result of a damaged item or wrong item is shipped. We make every effort to make your shopping experience with Pets Love to Shop is enjoyable, however, we do understand that problems arise and there may be a need to return or exchange an item. It is your responsibility to properly measure your pet(s) to insure you are ordering the correct size. Please contact us if you have questions regarding an item or sizing, we will be happy to assist you. If we can not answer the question we will contact the designer/supplier for you. We make every attempt to accurately describe every item we offer, we want your order to be exactly what you expected. Rest assured only quality items make it to our store. Any defective items are returnable. We do not stock all our items, to be able to offer the most current items & a large selection of colors and sizes, many of our items are shipped from another warehouse or from our designers or vendors. Not having to pay rent for a large warehouse lowers our overhead and that is how we are able to keep our prices affordable. Your satisfaction as a customer is vitally important to us. However, we do realize that issues arise. Our Return Policy is clearly listed here for your convenience in the unlikely event that you have an issue. Only Exchanges or Store Credit will be issued for return items, no exceptions. All returns must be approved, no exceptions. Please be very specific as to why you want to return the item. NO CUSTOM MADE, MADE TO ORDER OR PERSONALIZED ITEMS ARE RETURNABLE, unless they are defective. If you order an item and it is on back order or has been discontinued and we do not have it in stock, we will contact you to see if you want to substitute another item. If you choose to substitute we will adjust your order for you. You will be responsible for any price difference. If the price is lower than the original item we will refund you the same method in which you paid. If you want to cancel that item, we will refund you in full for the item, less shipping if applicable. 1. Contact us either by phone (505) 891-9244 or email petslovetoshop@gmail.com. State your Order number, the name the order is under, the item name and/or ID number and the reason you want to return it. 2. We will issue a RMA# for the return as long as it is not an item on our NON-EXCHANGABLE & NON REFUNDABLE list (below). We will also email the Return Address for the return. Please wait for this information. Do not return to the return address on your package, if it was not shipped directly to you from us it could be a vendors address. 3. Item(s) must be returned to us in its original and unused condition within 30 business days of receiving the item for an exchange or store credit. Shipping fees are "non-refundable", no exceptions. All approved returned merchandise must be unwashed, unworn, and unused and include tags and packaging. Tags should be secured to the item. All return shipping fees, tracking and/or insurance will be the sole responsibility of the buyer. Exchanges or Store Credits will not be issued until the item is received and inspected for resalable condition. Please inspect the item prior to returning for fur, slobber, stains, smells, etc. PLEASE do not spray perfume on the item(s). If you return an item(s) and you received free shipping on the original order and you want a Store Credit, the return shipping will be deducted. We do not ship and re-ship for free. The free shipping is for orders over $99 shipped in the US 48 for the initial order only. Returns or exchanges are subject to a 25% restocking fee after the 10 business day return time. Items can be discontinued at any time and if the item you are returning is an item that is being discontinued, we need the item back in the allowable time. Proper measurement is the surest way to avoid returns due to sizing issues. Sizing charts are on each page for each item. Please note, the sizing is not the same on all items, each designer has their own size chart. Your pup may wear a Small in one item and a Medium or Large in another. Please DO NOT order based on weight or the size of a currently owned item unless it is by the same manufacturer or designer and it is an identical item. Weight does not dictate a specific size. A 10 lb dachshund will have different measurements than a 10 lb pug. Proper measuring is crucial for proper fit. If you need assistance please email us at petslovetoshop@gmail.com. Because we realize that measuring a dog is not always easy, we make ourselves available via phone or email: petslovetoshop@gmail.com or you may call us at 505-891-9244 to answer any questions or assist you in the process. Please measure your pups Chest Girth, Length and Neck in inches PRIOR to calling. Weight & breed(s) are also helpful. If you need help with measuring please read our MEASURING GUIDE. We are dedicated to helping you find the right size for your pet. Our hours are Monday - Thursday 9:00 a.m. - 4 p.m. Mountain Time (Albuquerque, N.M.) Fridays are set aside for website maintenance. perishable orders will not be accepted for return. Custom and Special or Made to Order include Susan Lanci Designs and Preston Collars. Due to all the patterns, sizes & colors, we do not stock these items, they are made after your order has been placed. We must be notified within 3 hours if you want to cancel a Custom, Special or Made to Order Item. We expedite our orders and once an order has been place we are not able to cancel it. Questions or concerns? For fastest response, email shelly@petslovetoshop.com or phone 505-891-9244. Our hours are Monday - Thursday 9:00 a.m. - 4 p.m. Mountain Time (Albuquerque, N.M.) Fridays are set aside for website maintenance. ORDER CHANGES or ADDS: We will add or remove a product from your order within 24 hrs of your order. After 24 hrs of your order there is a $3 fee to add. If the item is not in our warehouse and has been ordered we can rarely cancel the order. We have to abide by our vendors policies. Therefore it is inparative that you contact us immediately if you need to make a correction. We can only add once per order, once an order has been completely shipped, we do not re-open it, a new order will need to be placed. The key to the fit is in the measuring. PLEASE take the time to measure and compare it to that Designers size chart. Not all designers have the same sizing. Just like with us humans. We may wear a Small with one designer, but a Large with another designer. The same holds true for pets. If you need help with measuring please read our MEASURING GUIDE, if you still need help, contact us, if it is after hours, you can state your pups measurement at checkout and mark the box that you need us to contact you before ordering. Please measure your pups Chest Girth, Length and Neck in inches PRIOR to calling. Weight & breed(s) are also helpful. We are dedicated to helping you find the right size for your pet. Our hours are Monday - Thursday 9:00 a.m. - 4 p.m. Mountain Time (Albuquerque, N.M.) Fridays are set aside for website maintenance. Custom, Special Orders and Made to Order Items are not returnable so please measure accurately. If you wish to cancel an order, we must receive the cancellation request within 24 hrs of the order since our orders are processed immediately to expedite shipping. If you would like to request that your order be canceled, please call us immediately at 505-891-9244 or email us at shelly@petslovetoshop.com to determine if it is possible to cancel a portion, or all of your order. If the cancellation is accepted and has not been shipped we will cancel your order and you will be issued a full refund. Please allow additional time for exchanges. During busy seasonal times, exchanges and returns are usually processed on Fridays. Our priority is processing & shipping new orders. * If you receive an item that is damaged, please contact us within 48 hours. Include your order number, date of purchase, and item name and/or number. Please describe the defect and send a picture to our email puprwear@aim.com. * You are responsible for providing your correct mailing address. If your purchase has to be reshipped due to insufficient address, you will be billed all shipping costs for re-shipping. * If you need to return an item more than once, a 30% restocking fee will apply. * Some items may be charged additional restocking fees, this is determined by our individual vendors policy. If an order is returned or refused due an incorrect shipping address, we will attempt to contact you with the phone number and/or the email provided with your order. If no response, a restocking fee of 30% will be deducted. If we re-ship the package with a corrected address, the customer is responsible for the re-shipping & tracking charges. PLEASE CONTACT US WITH ANY QUESTIONS PRIOR TO YOUR ORDER. WE MAKE EVERY EFFORT TO ACCOMMODATE YOU WITH MEASURING, ADDITIONAL QUESTIONS REGARDING ANY ITEM LISTED, CUSTOM ORDERS AND/OR SHIPPING. Prior to contacting us, PLEASE have your pups measurements available. Contact Information OR CALL 505-891-9244 MST (Office). We are available Monday - Thursday 9 a.m. - 4 p.m. THANK YOU.